Stockade fence is one of the most basic types of fencing products. 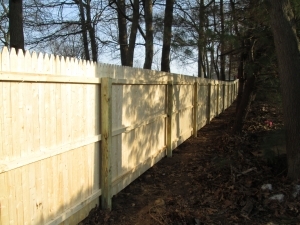 It is the standard fence one can generally see throughout Long Island along with chain link and post and rail. Stockade is moderately priced, and will give you a good lifespan for your money. Many customers choose to enclose their backyard on three sides with stockade, finishing with something more decorative like PVC (vinyl), cedar or aluminum in the front of their home. Our wood fencing is made entirely of top-grade material. The spruce stockade is No.1 grade spruce with a ¾” thickness. Cedar stockade is 100% cedar with cedar back rails. We never substitute with pine. We use a 1”x4” cedar flat board for all cedar styles: they look solid, and are sold. 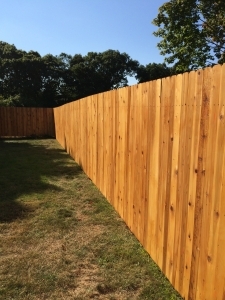 Our cedar fence is made with 2×3 back rails and assembled with stainless steel nails. All stockade fences are installed on 4x4x8 ACQ posts. Another option would be to use a 2-1/2”x8 metal post with cement footings. These characteristics make stockade fences the perfect choice for backyards with pools, whirlpools or other water features. They are also perfect for keeping pets within a yard, hiding unsightly areas or any other features that you may want to keep away from prying eyes. 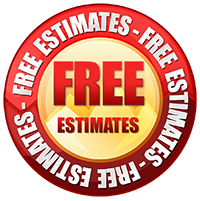 Call us today to make an appointment for one of our professionals to stop by your home and give you a free estimate! Contact us at 631-851-9730. We look forward to working with you! Thank you for considering Robert’s Fence Company.